Strike to Shut Down All New York City Transport! Charleston Five longshoremen arrested for defending picket lines against cop attack (January 2000). South Carolina clay miners appeal for solidarity in fight for their union (October 2001). NYU & CUNY: Strike to Win! New York University graduate students strike against union-busting NYU administration. “On strike, shut it down, New York is a union town,” chant enthusiastic pickets in front of New York University in downtown Manhattan. NYU is the largest private university in the United States. Since November 9, graduate students there – who do much of the teaching and grading – have been on strike for basic union rights. The strike lines have repeatedly brought out hundreds of picketers. They’re joined on the lines by members of many other unions, including professors and adjuncts from the City University of New York. CUNY is the country’s largest urban public university, and its teaching staff has been working without a contract for three years. On September 29, some 1,200 members of the CUNY faculty union jammed the Great Hall of Cooper Union for a meeting, where every reference to a possible strike was applauded. A strike at CUNY would face the Taylor Law banning public employee strikes in the state of New York. A joint strike by NYU and CUNY, a strike to win, that brings in thousands of undergrads and mobilizes real workers power to shut down the campuses – that’s what we need to be organizing to defeat the arrogant administrations at both universities and win a real victory for us all. This is particularly important given the concerted assault against graduate student labor organizations across the country. The spirit is certainly there among NYU strikers, who display enormous energy, determination and creativity on the picket lines. Stickers proclaim “Honor the Picket Line,” “NYU on Strike” and the popular favorite: “The Nerds Are Pissed.” (A variant reads, “Nerds On Strike to Make You Even Smarter.”) Hand-made signs cover the gamut from “This Medievalist Won’t Be a Serf in [NYU president John] Sexton’s Fiefdom” to “WASPy Babes for GSOC.” The Graduate Student Organizing Committee is part of United Auto Workers Local 2210. A genuine campus spy story erupted in the strike’s second week. Outraged faculty members discovered that administrators had secretly joined “Blackboard” electronic discussion groups in order to monitor pro-union opinions. Professors angrily protested that this action “threatens academic freedom and autonomy.” Meanwhile, the administration set up a “snitch line” – a special phone number for those who want to rat out their TAs for going on strike. Social science students can see the class dynamics of the city minute by minute, as truckers, delivery van drivers, phone workers and cabbies honk in support of the strikers, while yuppie business types turn up their noses and hurry past. Class is what it’s all about in a strike against NYU, a super-wealthy institution that’s one of the biggest landlords in the city. Rolling in money and stoked on a permanent power trip, the NYU administration thinks it can get away with blatant union-busting. GSOC was originally recognized following a 2000 National Labor Relations Board decision recognizing NYU graduate students’ right to a union contract. But following a new NLRB decision in 2004, NYU issued a diktat that it would no longer negotiate with the union, and slashed grad students’ health care. Labor leaders note Bush stacked the NLRB (the government body whose raison d’être has always been to control and discipline labor). But, as an article in the Village Voice (16 November) noted, two top aides in Sexton’s union-busting crusade “emerged not from the GOP...but from the Clinton White House”: NYU’s VP for operations Jacob Lew, Clinton’s former Management and Budget head, and Cheryl Mills, one of Clinton’s lawyers during the impeachment flap. Yes, Virginia, the party of capital really is a bipartisan affair. Reveling in his tough-guy stance, Sexton proclaimed that the union can “either die a quick death or a slow death,” but the university won’t budge. As in any strike, what counts here is power. Grad students do not have the kind of social power that transport workers or coal miners do. They are a vulnerable, usually transient workforce. The key to winning a campus strike lies in actually shutting the campus down. A lively GSOC flyer, “Picketing 101,” reads “No scabbing! Don’t teach, research, or cross a picket line!” on one side and “Thank you for not crossing picket lines!” on the other. The chant “Picket lines mean don’t cross” was picked up with gusto when introduced by some CUNY Internationalist Club comrades. But it’s not enough to move classes off campus, as GSOC has requested and many sympathetic professors have done. In order to win this strike it is necessary to shut down classes, and to bring out the rest of NYU workers so that the university literally stops functioning. On November 16, a group called Faculty Democracy called a “Town Hall Meeting on the Current Crisis on Campus,” inside NYU’s Silver Building. Many GSOC members asked whether they were supposed to go in, since it is a struck building. To their credit, GSOC picket captains built a large picket line around the building, and most told strikers not to go in. Yet “The World Can’t Wait” (the latest liberal front group of the Maoist RCP) announced a “Drive Out the Bush Regime” meeting in a struck building. On November 19 a “Student Solidarity Meeting” was scheduled for another part of the struck campus. The Campus Antiwar Network, meanwhile, scheduled a meeting for November 29 in the struck Kimmel Building. Sending the message that it is OK to cross picket lines after all undercuts the most basic understanding of what the strike is all about. Picket lines mean don’t cross, period. And the key is to build militant picket lines that no one dares cross. Shut It Down – One Out, All Out! The potential to win is shown by the willingness of many unionized truck drivers to stop deliveries rather than cross the picket lines. New York is a union town, and labor could mobilize thousands to shut the campus down in an instant. Yet the labor tops have limited themselves to the ritual arrest of AFL-CIO head John Sweeney at a September support rally. NYU employees are divided into various separate unions whose leaders negotiate separate expiration dates and have kept operations going during this strike. Maintenance, supply, elevator repair, garbage disposal and all the other plant work goes on. AFT Local 3882, representing clerical workers, just signed a contract, with a clause against sympathy strikes. Most absurd and self-defeating is the existence of a separate union for NYU adjuncts, UAW Local 7902, which operates out of the same office as striking UAW 2110 – but continues to work during the strike! During the 2003 Yale University strike, clerical and other workers mobilized en masse, shut down streets, paralyzed crucial work, and beat back a haughty, aggressive administration. Members of the Yale workers’ union have repeatedly come to the NYU picket lines to show their support. In contrast, the recent (2004 and 2005) Columbia University graduate assistant strikes were lost: UAW 2110 struck but the union tops had clerical and other workers, often members of the same union, continue to work. The concept of dividing the workforce into separate unions (craft unionism) was overcome in auto, steel, transport and other strategic industries in the 1930s’ battles to build “industrial unions.” On college campuses seven decades later, splitting workers up this way just plays into the administration’s divide-and-conquer strategy. Fighting to win the current NYU strike would help open the way to unite everyone into a single union of all university employees. This should include the professors, who don’t have their own NYU union and in most cases continue to teach; it clearly must not include administrators, campus cops and other enforcers for the employer. Strike CUNY – Smash the Taylor Law! The CUNY administration matches NYU’s when it comes to high-handedness, arrogance and contempt for those who do the work on campus. It has pushed a hard, anti-union, takeaway line in negotiations with the Professional Staff Congress, the faculty union whose contract expired back in ’02. Four years have gone by with no raise; the administration is bleeding the health-care Welfare Fund, and seeks a series of anti-union concessions. The CUNY teaching staff has been pushed beyond endurance. Conditions are particularly dire for CUNY’s adjuncts, who do most of the teaching at City University but are paid starvation wages (amounting to about $10 per student per month), with no job security, benefits or, in many cases, health insurance. At the September 29 mass meeting at Cooper Union, PSC members heard the union leadership pledge not to negotiate a giveback contract. “Solidarity” was pledged by NYC school teachers’ union head Randi Weingarten – who just shoved a giveback contract down her members’ throats. Every mention of a possible job action was greeted by the standing-room-only crowd. When a CUNY adjunct and supporter of the Internationalist Group called to prepare for a strike and to smash the Taylor Law, he was enthusiastically applauded. The Taylor Law was passed one year after the 1966 subway strike, when TWU leader Mike Quill became an instant folk hero. Jailed for defying the no-strike Condon-Wadlin Act, he said, “The judge can drop dead in his black robes. I don’t care if I rot in jail – I won’t call off the strike!” The strikers stuck it out and won. A TWU official spoke at the September 29 PSC rally, yet the transport workers’ leadership, in thrall to the bosses’ politicians, refuses to use the power of this strategic union, which could shut the city down and spearhead a fight to smash the Taylor Law once and for all. In her speech to the rally, PSC President Barbara Bowen noted that the administration’s intransigence is part of a “well-developed agenda of dismantling the public sphere,” that CUNY “cuts costs in the time-honored corporate way” by replacing full-time faculty with underpaid part-timers, and “the austerity agenda for CUNY is an expression of contempt for our students.” Particularly after all the PSC leaders’ talk of a “job action” and criticisms of other city unions’ giveback contracts, any concessions to CUNY’s takeback agenda would greatly undercut the union. Already, many counselors (who are heavily black and Latino) are up in arms, and rightly so, because the PSC tops have agreed to let college presidents reclassify them as HEOs (Higher Education Officers), meaning they would no longer be faculty and would be denied the right to vote on many matters. Many adjuncts, in turn, feel they are poorly represented by the union. Facing a hard-line employer brandishing strike-breaking laws, an effective fight requires class-struggle methods and leadership. 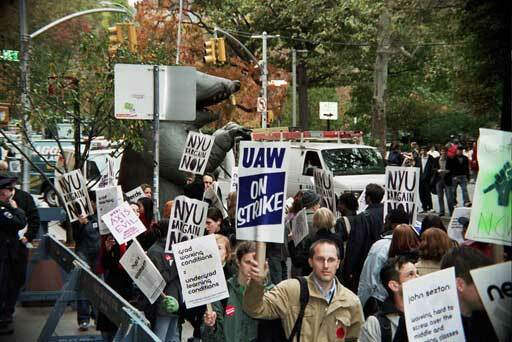 With NYU already on strike, a joint CUNY/NYU strike is clearly called for. For starters, strike committees should be elected now, at every CUNY campus. These committees should bring together PSC members, other campus workers and large numbers of students, mobilizing to shut the entire CUNY system down tight and bring in the power of the heavy battalions of NYC labor. A real fight for the right to education would get an enormous response from the multiracial, largely immigrant working class of this city. Against the haughty diktats of the CUNY and NYU tops, we call for abolition of the administration, for student-teacher-worker control of higher education, and for open admissions, no tuition and a living stipend for students, to make education available to all. A struggle of this breadth and scope could simultaneously turn back the wave of attacks on the right to campus protest (as in the Miguel Malo and Carol Lang cases at CUNY), and drive out the recruiters for the U.S. war machine. These points must be part of a program for class-struggle leadership committed to breaking labor from the pro-war, pro-Taylor Law Democratic Party and building a revolutionary workers party.